The Drake Bulldogs erased a 15 point half-time deficit to beat Rutgers 69 to 59 in the first round of the Vancouver Showcase on Thanksgiving. Drake outscored Rutgers 40 to 15 in the second half. The win moved Drake to 5 - 0 on the season including a season-opening game win against a second Big Ten opponent, Nebraska. The Bulldogs will play Notre Dame tonight (9pm Eastern) in the semi-finals of the three-day tourney. Drake has won the Missouri Valley Conference regular season and tournament championships each of the last two seasons — going 26-8 last season and 28-5 the season before. Drake has been a perfect 18-0 the previous two seasons in regular season conference play. The Bulldogs have been knocked out in the first round of the NCAA tourney — to Texas A&M (ND’s eventual Sweet Sixteen opponent) 89-76 last season and Kansas State, 67-54, the prior season. Drake is an experienced team and starts two fifth-year players, a senior, a junior and a sophomore. The team’s leading scorer so far this season is 6’1” forward Sara Rhine, who comes off the bench to average 16.4 points and 9.0 rebounds per game. She’s listed as a redshirt junior. Becca Hittner, a 6’ guard, is averaging 15.4 points per game. She’s 9 for 23 from three. Maddy Dean, a 5’9” guard, is averaging 11.0 points per game, and Sammie Bachrodt, a 5’10” guard, is averaging 10.2. Bachrodt has taken 34 three-point shots and made 12. Overall, the Bulldogs average a little over 10 made threes per game (52 for 131 - 39.7%). Over 40% of their shot attempts have been from beyond the arc. Drake is averaging 79.8 points per game and is shooting 47.1% from the field and 68.6% from the line. 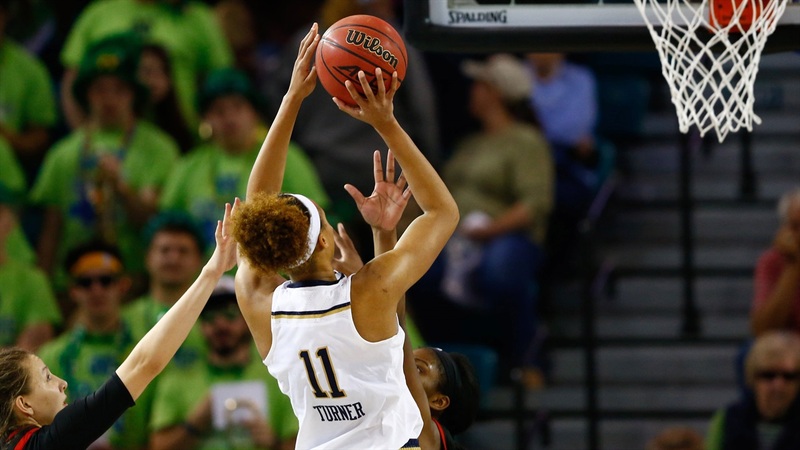 Notre Dame started off slowly against first-round opponent, Gonzaga. The Irish missed 10 of their first 12 shots and fell behind 14 to 7 four minutes into the game. ND outscored the Zags 14—4 over the balance of the first quarter to take a 21-18 lead at the first break. The Irish stretched the lead to 11 at the half and 15 at the end of the third quarters. They scored the first 9 points of the fourth quarter to go up by 24 points. Arike Ogunbowale had a poor shooting first quarter — just 1 for 7 from the field including 0 for 3 from three-point range. She didn’t take a shot in the second quarter but came alive with 18 points in the second half — shooting 7 for 12 including 1 for 1 from deep. She ended up leading the Irish scoring with 21 points. For the game, she also added 6 rebounds, 2 assists and 3 steals. Both Jessica Shepard and Brianna Turner registered double-doubles — 16 points and 10 rebounds for Turner and 15 points and 14 boards for Shepard. Jackie Young replaced ailing starter Jordan Nixon at point guard. Young had 8 assists with just 2 turnovers, 14 points and 5 rebounds. Nixon is reportedly recovering from a concussion suffered during the game with DePaul last weekend. Freshman Katlyn Gilbert made a significant contribution off the bench yesterday with 14 points (5-8 from the field and 4-5 from the line). She added 5 rebounds, 1 block and 1 steal in 33 minutes of playing time. She showed defensive quickness and was strong going to the basket. Notre Dame out-rebounded Gonzaga 50 to 33. The Irish scored 56 points in the paint vs. 34 for Gonzaga. After shooting just 40% from the field in the first half, ND made 51.6% of its shots in the second half. On the other side of the bracket, both ranked teams won. Ninth-ranked Oregon State topped Western Kentucky 74-60 and 13th ranked South Carolina roared by Eastern Tennessee 101-55. The Beavers and Gamecocks will meet in today’s second semi-final game.